You can't miss with this one. You don't have to spend any money on flowers and the tray is from the Dollar Tree store. Sometimes the first rose blooms of the season can get really large. This one was 6 inches in Diameter and the color was a vibrant fuchsia. A beautiful bud vase is great to have. I have several. This one is very delicate with ribbing and lots of curves. For more ideas see: http://www.floristinyou.com/vases-101 If you have your bud vase, your rose, and your 'silver tray' you are ready to roll. Select a bud vase to use. 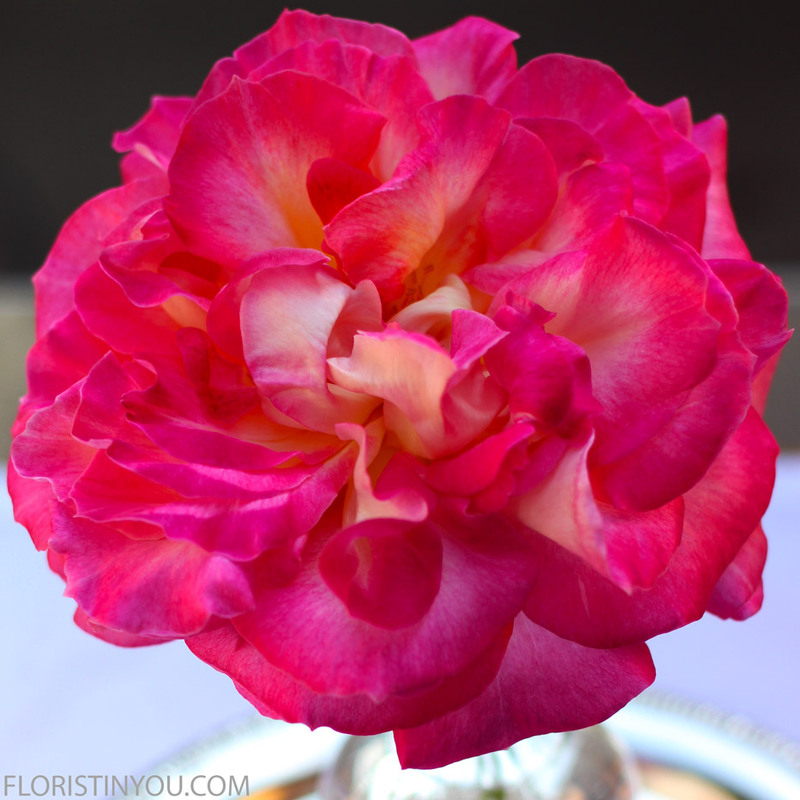 Cut a garden rose. Snip bottom of stem at 45 degree angle. Leave the stem an inch above the rim of the vase. Put the rose in the bud vase, and put them on a silver tray. This tray is 9.75 inches Diam. The lacy petals on this bloom make it very 'showy'. The pink with a touch of white and yellow fringe is lovely. Very simple yet elegant. You are done. Enjoy!